Only Authorized Reservers are allowed to make reservations for the organizations they completed the Authorized Reservers Training for. They are the two officers within your organization who have access to CES. Meeting reservations for Winter Quarter can be requested through CES starting the end of Fall Quarter Instruction, December 7th, 2018. Reservation requests for MTGs must be made at least two business days in advance to ensure enough time for the approval process. Requests for Special Events may be made for Fall Quarter of the next academic year. Special Events planned for Winter and Spring Quarters for the 2018-2019 school year can be made starting the beginning of Fall Quarter, September 24,2018. Note: Reservation requests on hold due to insufficient funds must be acted upon within 2 business days. Special Event reservations will be accepted if the RSO can provide picture proof of the Agency Account activation deposit. Failure to take any action may result in the request being cancelled. It is also recommended that the group’s financial officer be notified at the beginning of the reservation process and kept informed of expenses as cost estimates are received. 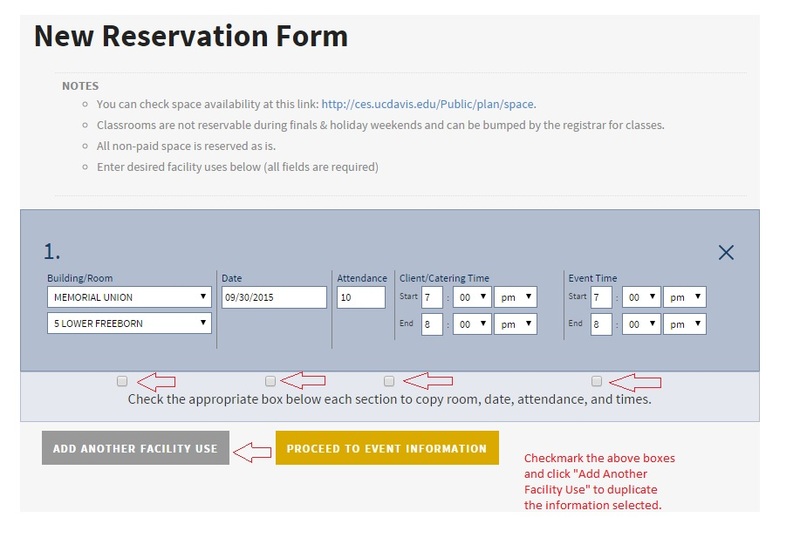 Before making a reservation, you can check to see if the space is available by date and time using this form. 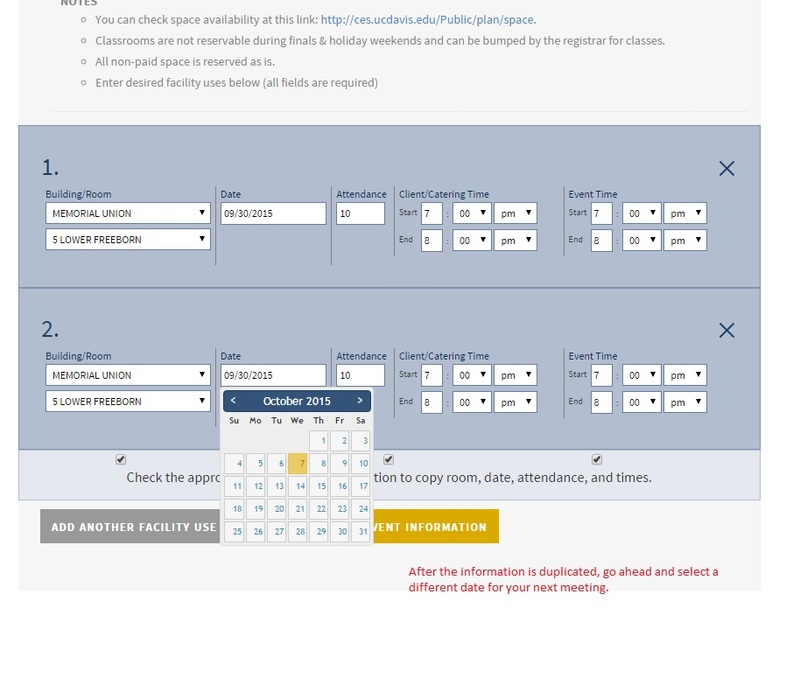 You can look at classroom setup, media capabilities, and seating capacity in the Classroom Lookup Guide. If your desired space is available, you must reserve the space here at the bottom of the page. Indicate the type of insurance that your student organization is covered by. Meetings (MTGs) refer to general membership club meeting reservations; usually re-occuring. 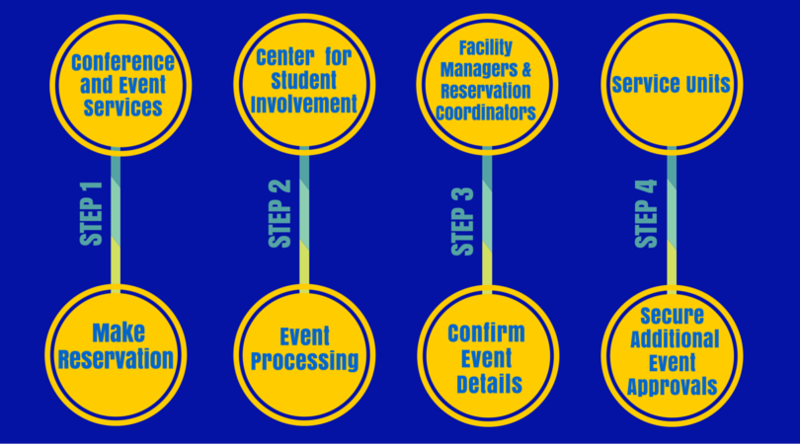 Special Events (SPEs) refer to one-time reservations for events such as banquets, workshops, and/or conferences. Did you know that you can reserve more than one space for re-occurring meetings in the same form?! You must rearrange the room contents (i.e. furniture, AV equipment, etc.) in their original positions. If the space is not arranged properly and/or missing contents, you may incur charges to restore the room. Damages of any kind will incur CES coordination fees and Custodial charges to restore the room.